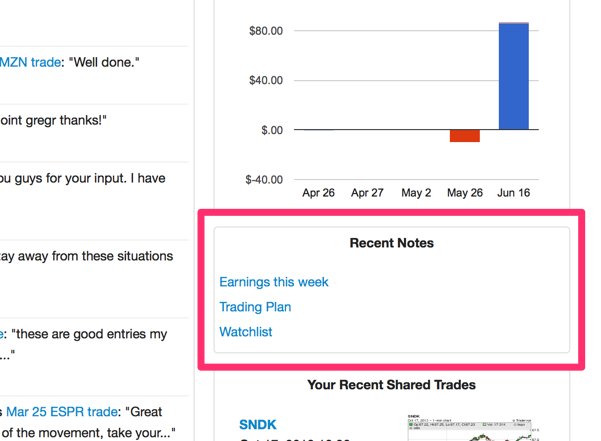 Ever since we introduced general notes to Tradervue, they have proven quite popular. Traders have told us they’re using them to record their trading plan, keep watchlists, and make market notes for the week, just for a few examples. The 5 most recently updated notes will be shown; if you have yet to create any notes, you’ll see a link to create your first note. New users and those who have never customized their Dashboard will see the notes box there immediately. If you have customized your Dashboard, we haven’t changed your settings, so you won’t see notes right away. To add them, you can Customize your Dashboard.